We were very happy owners of a Ranger 25, the "Laurie Ann" and kept her on a trailer in our driveway. Over 6 years, we trailered her over 5,000 miles, cruised 6,000 miles and put nearly 1,000 hours on her Yanmar 110 HP engine. 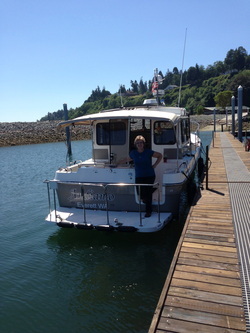 See our website: www.laurieann-ranger25.com Then in early 2013, we made the decision to execute our dream of doing the Great Circle Loop, that inland waterway that goes from Chicago to Mobile, Alabama, along the Gulf Intracoastal Waterway to Florida, up the east coast on the Intracoastal Waterway (ICW), and through the canals to the Great Lakes. We had a done the western portion of the Great Loop in the Ranger 25 in 2008 and loved it. It was time to go back. After looking at several options of boats to use on the Great Loop and dipping our toe in the water on a couple them, we opted to find a boat in the Pacific Northwest, outfit it to our needs and have it trucked to the Great Loop. Then, the stars lined up and what seem to be meant to be, just happened while we were attending a rendezvous of tug owners at Fisherman's Terminal in Seattle. We knew that Jorge and Marcus were selling their Ranger 29 as they had moved aboard a Nordhavn 40. But we really never actively considered it until they brought "Tradition" to the rendezvous and moored near our "Laurie Ann. " We were both awed by the condition and the opportunity of the price point. Within hours, the deal was crafted and three weeks later, the boat was ours. Jorge and Marcus had taken great care of this Ranger 29 and my number one boat expert, Brad, told me that he could not find anything wrong with it. The boat was financed through Trident Funding and they do a lot of business with Ranger Tugs. For insurance, we got a number of quotes and after following up on a referral to Anchor Marine, we chose them to insure our Ranger 29. They also, do a lot of business with Ranger Tugs and they really get it - plus there quotes were the best and the coverage was the best. The names for our boats have always come easy. Last fall, we were on on Rick Steve's tour of Europe, his "Highlights of Europe" that was 7 countries in three weeks. We were spending five days in Italy and our fabulous tour guide, Jennifer, would say, "Andiamo," which is pronounced on-dee-om-o, and more importantly, translates to "Lets Go!" We looked at each other and knew then, that our next boat would be named "Andiamo." We thought we were so original until seeing a list of the common boat names. In 2010, Andiamo was in the top ten list. "Lets go" is the two word expression that captures much of our traveling spirit. Every boater who has done a significant adventure, always says, "do not wait, just do it now because your life will change and the window of opportunity will close. We bought this boat for one purpose, to use it, "Andiamo!" The graphics for Andiamo came from BoatUS and was ordered on their website. We applied the graphics and find it easy to do. This photo was taken right after the graphics were applied while we were docked at the private marina at Hat Island in Puget Sound. GREAT LOOP (GL) TRIP: The Great Loop is the circumnavigation of America's inland waterways and the Intercoastal Waterway that includes the Great Lakes, Chesapeake Bay, the Hudson River, the Erie Canal, Canada's Trent Seven Waterway and the Georgian Bay and North Channel on Lake Huron. This trip is nearly 6,000 miles and we did it in about 10 months. What follows are additional and individual pages that are portions of our log with some selected photos.